Image courtesy of Find A Grave. 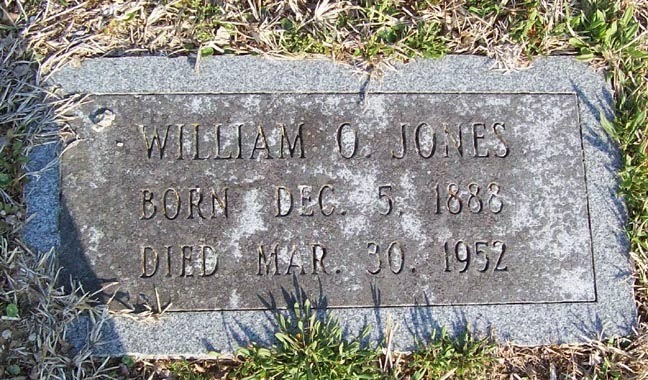 William Oliver Jones was my maternal 1st cousin 3x removed. He was a son of Louis Oliver Jones and Esther Lincoln Jones and the nephew of my 2nd great grandfather, Alexander Hamilton Jones. He was a lifelong resident of Morehead City, NC. Andrea, this is a lovely stone, thanks for sharing. I have found many stones like this that are laid flat to the ground, and in cemeteries that don't have regular maintenance, they are often lost because the turf grows over them. How sad!